As I mentioned Sunday, I wanted to take some time to mention some of Foster's specific proposals for living a simpler, more God-centered life. I was surprised how specific he got in the second half of the book. Indeed, Foster himself cautions readers not to seize on any of his proposals as rules by which to judge or control others. 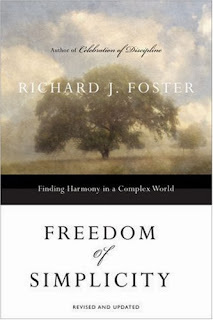 He warns against "our tendency to turn any expression of our simplicity into a new legalism. How quickly we calcify what should always remain alive and changing." Yet, in his defense, the author says that to resist laying down any practical guidelines means we reinforce the legalism of the status quo. New Testament writers like the apostle Peter felt the liberty to address issues of their time and culture (braided hair and fancy robes anyone?) as excesses unbecoming for a Christian. Just as Peter spoke to particulars of his day, "our task is to discern what constitute ostentatious elitism today, and speak to that situation" and to "walk the narrow path of precision without legalism." A tiny experiment in voluntary poverty that many of us could do with genuine profit as God prompts us. We can go through our home, find one possession that we value, and consider, "Am I growing too attached to this object? Is it becoming a treasure to me?" Having examined our hearts before the Lord, let us give it away. We must not rationalize by saying, "But after searching my heart I know that it is clearly not a treasure to me, and so I don't need to give it away." If it is truly not our treasure, we will not mind in the least giving it away; and if it has become our treasure, we will want to give it away for our soul's sake. Also we will pray for the person who receives our little gift, that it will be a blessing, and not a hindrance, to his or her walk with God. So, my immediate thought is that this little experiment, if applied to everything we own, would ultimately lead to voluntary poverty as every item we own is either a treasure to be severed or not a treasure and therefore easy to give a way! But I decided to try it anyway. 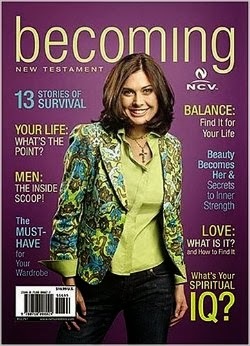 A couple of weeks ago, I wrote a review of Becoming, the magazine Bible for women, and mentioned that I planned to give it away. Well, I'm ashamed to say it has sat on a little table in my living room ever since. It is clearly not a treasure to me, and yet, I never took deliberate steps to give it away, as I felt moved to do! Happily, my good friend, Tracey, is coming over after work to pick up the bible and bring it to jail with her, where she ministers to women hungry for God. I'm praying that this magazine, thick with simple articles and scripture, will feed one or many women-- I believe that the Spartan environment in the jail makes many of them hungry to read. So, my next tiny "experiment" is a little different. I've decided to forgo buying Stephen's kindergarten pictures. I take tons of photos of all three of my sons, many of which can be seen on one of my other blogs, The Daily Munchie. I was filling out the envelope for the photos, due today no less, when I realized that I don't have to purchase a photo package. It's not a sign I don't love my son or want to capture memories of him at each milestone. And my relatives won't love me any less if I give them candid shots of my sons instead of the posed, somewhat awkward portrait the professional took. Now, don't get me wrong, I like to support local businesses and believe that artists, like portrait photographers, do important work. But I decided to listen this time and to get into the "divine Center," and I found out I don't need to possess those photos after all.